Max Dire (Van Peebles) is one of the best and bravest officers on the LAPD. You might even say he has a talent for getting out of DIRE situations with MAXIMUM firepower (see, that’s why they pay us the big bucks, heh heh). Because of his stellar track record as a crimefighter on the mean streets, he attracts the attention of Adam Garou (Payne), a mysterious man who wants Max to join his gang of underground vigilantes to clean up the streets in their own way. They even use a mysterious drug to give them superhuman powers. At first, Max is reluctant, but the clever Adam has Casey Spencer (Kensit) seduce Max onto his squad. The conflicted Max tries to make the best of the team of unkillable vigilante werewolves (how often do you get to say that phrase? ), but in the end must face his demons on his own terms. Can he do it before the FULL ECLIPSE? We thoroughly enjoyed Full Eclipse. It’s a lot of fun, and delivers everything you want. There’s a lot to love and appreciate about this movie - not only is it a solid action movie in its own right, but it puts a nice spin on the cop/action drama. 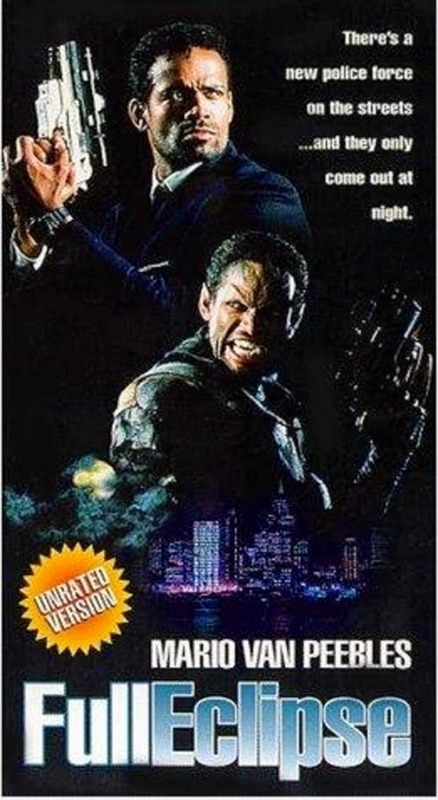 It even puts a spin on the vigilante movie, which we especially liked, because we love those, generally speaking, and if you add in werewolves, it’s hard to lose. Another plus was the use of real, practical effects, no CGI garbage. And the great cast ties it all together, along with the fast-paced direction of Hickox. 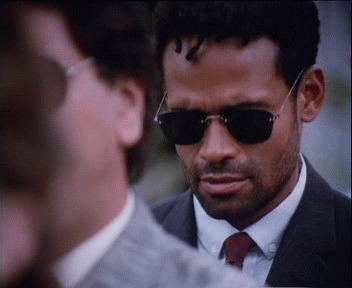 Mario Van Peebles was terrific as Dire: not only is he a quality 90’s coolguy with his ever-changing beard stubble, loose ties and sunglasses, but you can feel his conflict as it relates to the unfolding werewolf situation. 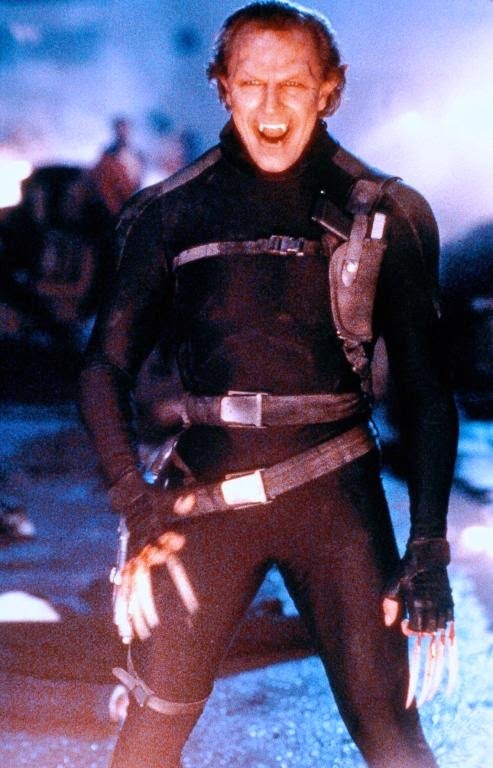 On top of that, he shines in the action sequences, as he fires two guns while diving through the air in slow motion, in true John Woo style. The opening “punks take over the dance club” sequence was indeed a movie highlight. Fan favorite Bruce Payne matches him, giving a totally committed performance. Sadly, only fans like us (and by us I mean not just US, but you reading this as well) will appreciate this - Payne receives no awards, never gets to chat on the late night shows, but is far more competent than many that do. The whole thing is classic 90’s; just the type of thing you’d see on the pay-cable channels or in the video stores of the day. So while this even has a dash of the then-current “homie movie” (there is a drive-by shooting and Van Peebles has a tendency to say “yo yo yo”), Full Eclipse, in general, is a cut above the average DTV film, in our opinion. The only bad thing is that this was a point in time when annoying pop-culture references were starting to pop up in characters’ dialogue. But the 80’s weren’t that far behind, as you know that Dire’s partner, who says he’s “getting married”, is “too old”, and is nervous and complaining a lot, that he’s not long for this world. Full Eclipse, in general, is the next logical step up from Wolfen (1981), and the outing in general is never dull. It sports a killer concept, and a nice execution that lives up to it. We recommend it. Got VHS and DVD. One of the best of Hickox, Payne, van Peebles and eyecandy Kensit. Love this movie. Happy you love this movie too. Very underrated. This was one of the those hidden gems I found on the shelves of Family Video. Peebles is a great actor, one of his best performances was in Raw Nerve. Totally fun movie. Agreed. Raw Nerve was pretty good.